It’s (almost) the most wonderful time of the year! You and your family are invited to participate in one of our Christmas gatherings this year! 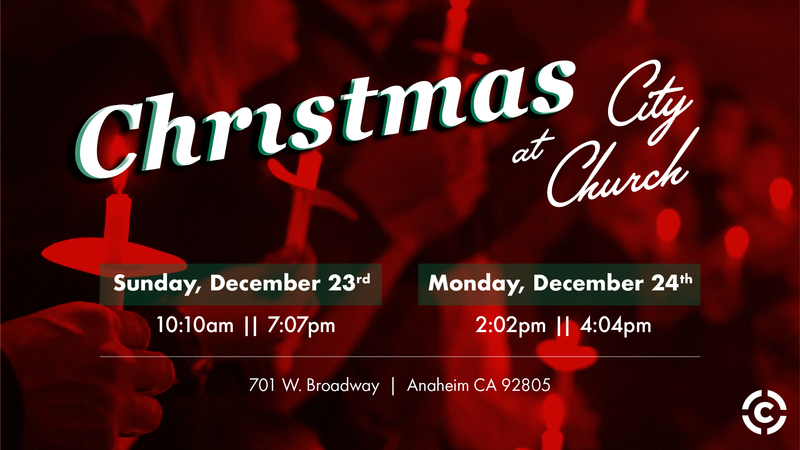 You can expect some tasty refreshments, a family holiday photo spot, some of your favorite songs of the season, an inspiring message from Pastor Kyle, and for us to make much of Jesus Christ. Though we won’t have any dancers dressed up as angels flying over the audience, we will drum our little drums and bring our creative best for King Jesus. We hope you’ll enjoy it. Kids ministry will be provided for ages 6 months to 4 years old. Older kids are encouraged to sit in church with their parents as it will be a “family friendly” and interactive experience for the whole family. REGARDING PARKING: It would be great if you would consider parking at the Anaheim Public Library (if you are able) as it could get tight in our small parking lot. It’s a 3-minute walk.